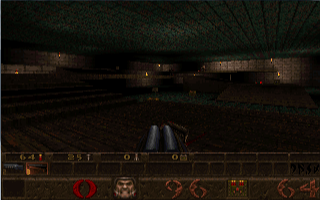 Quake’s immense popularity resulted in many unofficial expansions being released. 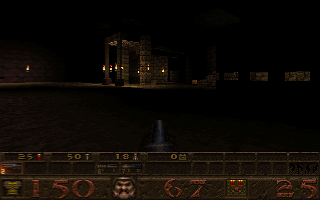 Aftershock for Quake, developed by Backpack Software and published by Head Games in 1996, was just one of them. Shoved into the disc are piles of downloaded maps from the ‘net, alongside some brand new textures, map editing equipment and much more. It’s no shock that people didn’t bat an eyelid after its release. No plot is present, except the poorly-spelled notes and rants by one of the map-makers explaining about the third episode. Each episode is made up of just five maps for the main course and no secret missions for supper. Instead, a fourth chapter offers a collection of Head Games’ deathmatch maps. The boys in marketing did a poor job with the advertising on the packaging. The back of the box smugly shows screenshots of levels with spooky names, like ‘The Red Room’, and ‘Hell Hole’, most of which feature the protagonist poking a shotgun in a monster’s face rather than admiring the excellent level designs (not like there’s any of that to be found). The launcher is a quick and easy piece of kit to use, meaning you can pick a new mission or one of the original Quake levels to leap to, yet it won’t bother letting you tweak the difficulty. Besides, the new missions are weak in quality as well, offering with unbalanced and unfair game-play with enemies shoe-horned into each corner. If you click on the new levels button, then on the original missions, then back on the new ones, it’ll knacker the list up, meaning no maps can be chosen unless you restart it or enter a level and then exit the game. Are you after some puzzles? Well, does generic button sequences, killing enemies to open doors, buttons sticking out of the blue and a complete lack of thought required to beat said ‘puzzles’ sound appealing? Of course not. Quake’s puzzles were simple, but Aftershock’s are no-brainers. Aftershock’s maps are just big, ugly and sprinkled with guns ‘n’ baddies here, there and everywhere. Some actual secrets that require effort to access would have been nice, but there is a particular famine for hidden areas on the whole anyway.The final level in particular is a joke. There is a bridge with two rock platforms. Go across the pit and collect some weapons and other goodies, kill the bad guys, and jump into the pit at the other end of the bridge. Congratulations, you’ve won. If you have that itch to play some deathmatch games with your friends, there is an abundance of them to choose from, be they part of the Aftershock levels or as part of the unmarked collection of around fifty fan-made levels thrown together in no particular order. Many of these levels are poorly designed and make for some truly dreadful deathmatch games. Some have no way of exiting them, either. As for new content, there are no new songs, weapons or enemies. There are a few new textures that offer some bright green bricks or silver steel to the otherwise predominant brownness that is Quake. Compiled into the disc is a map editor for Quake for anyone to create better maps, as well as a notepad of poorly-spelt tips and walk-throughs that anyone could find on the ‘net with ease. On the whole, while BackPack Games tried their best to crank out a decent expansion, there are little redeeming features from this unofficial expansion pack that make it worth trying out. The levels are poorly-designed and are hardly-amusing to blast through, there is a lack of balance in difficulty, the multiplayer maps are uninspired and dull, and the puzzles require little effort to complete. You’ll find nothing satisfying in this one, Quake-fans.